Experience the Midwest's premier digital marketing conference, featuring expert speakers from across the world. RESEARCH + STRATEGY Effective marketing starts with understanding your goals, your customers and the plan to reach them. BRAND COMMUNICATIONS Content strategy informs everything we write – and how we help you activate. WEB + APP DEVELOPMENT Our full-service team has extensive experience building enterprise Drupal sites. SEARCH + DIGITAL MEDIA We're driven by your actual business goals -- not vanity metrics. BRANDING + DESIGN Bring your brand to life through powerful storytelling, campaigns and design. Upward: @adlanternapp @dustinboot76 @djking02 It's been a pleasure to work with your team! Always striving higher. That's the spirit behind Upward. It's an agency philosophy that permeates everything we do. 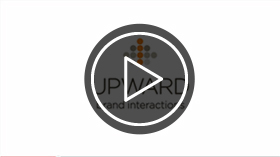 Upward is a fully-integrated brand and interactive marketing agency that helps brands thrive in traditional and digital environments.